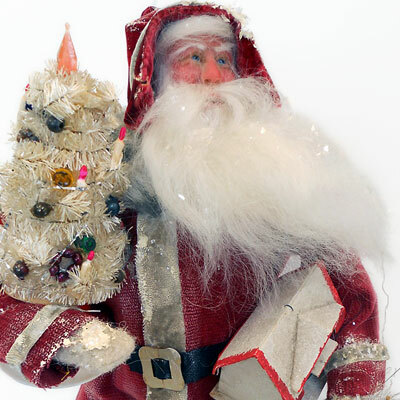 This 1950's era santa reminds me of my childhood. All of his toys are from that time and include: a decorated tree, a cardboard house from a train platform, a plastic reindeer, a celluloid doll and a wooden boat. I painted the old red candy container boots, used vintage cotton velvet for his coat and sprinkled him with mica snow. His jolly expression was achieved by sculpting the wrinkles around his eyes and giving him a toothy smile under his whiskers. I hope he brings Christmas cheer!